Google has rolled out a new beta update to the Gboard users for Android users which brings lots of new features to the keyboard app. One of those features is a new sticker gallery which shows all the stickers on a page now instead of a small tab. Another major update is Make a GIF feature which enables users to create their own GIF using the camera and send them via any messenger app. The GIF tab is available on the Gboard which shows all the available GIFs from the internet but now it has a new function called, Make a GIF under “My GIFs”. Tapping the button opens up the camera (it will ask permission to open the camera for the first time) to create your own GIF. You can shoot a reaction of yourself which could be three seconds long and then you can use it. The My GIFs tab saves all the GIFs you have created and you can reuse them whenever you want to. This feature is not available for all the Gboard users and if you are the lucky one, you will see this feature on your beta Gboard app. The rollout will start soon and you will be able to use all these new features. 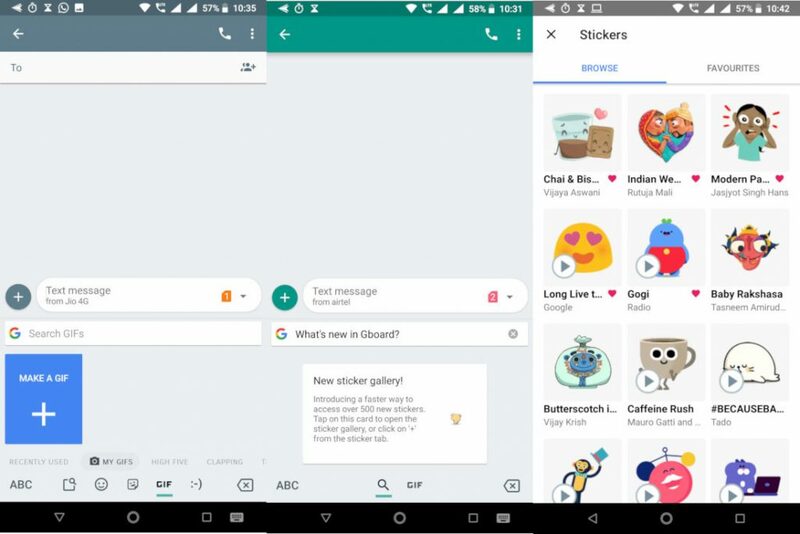 Another feature is the new sticker gallery, it shows the stickers in a full-page interface now instead of a tab. If you want this feature right now then you can download the beta Gboard app from here or wait till Google pushes this update to all the users.